REMEMBERING our teenage years with hits such as Crazy Horses and Love Me For A Reason – we knew we had to visit Grimsby Auditorium to see The Osmonds in their Up Close And Personal Tour. We settled down in our seats at the front of the circle, and we were excited with anticipation to see the famous brothers live. We were surprised to see a mixed age group, from teenagers to grandmothers ... they have obviously captured everyone's hearts. To get the audience going, trivia questions projected on a big screen. The whole audience shouted out the answers to questions such as: How many books have been written about the Osmonds? (It's five, by the way). Despite singing for all these years, The Osmonds still had great voices, opening with Crazy Horses, followed by We're Having A Party. They looked very smart in their suits, and good for their age. They introduced their new album, Can't Get There Without You, and sang the catchy title song. They interacted with the audience making jokes and spoke to a lady who was celebrating her silver wedding anniversary – without her husband! We were remembering the good old days, and, of course, Jimmy ended up singing Long Haired Lover From Liverpool. 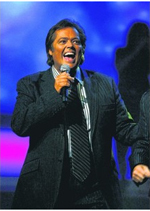 It seemed like yesterday when they showed clips of the Osmond family throughout the years. And finally the show ended (unfortunately) with Love Me For A Reason and another snippet of Crazy Horses. It was well worth seeing and our passion for The Osmonds has been reignited once again. Guest reviewers Diana Greensmith and Philippa Parkin.